For more than thirty years Natalie Goldberg has been challenging and cheering on writers with her books and workshops. In her groundbreaking first book, she brings together Zen meditation and writing in a new way. Writing practice, as she calls it, is no different from other forms of Zen practice—"it is backed by two thousand years of studying the mind." This thirtieth-anniversary edition includes new forewords by Julia Cameron and Bill Addison. It also includes a new preface in which Goldberg reflects on the enduring quality of the teachings here. She writes, "What have I learned about writing over these thirty years? 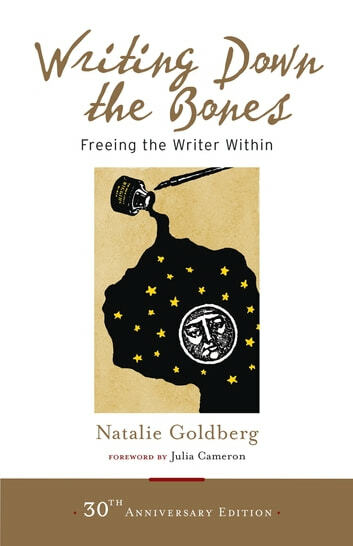 I’ve written fourteen books, and it’s the practice here in Bones that is the foundation, sustaining and building my writing voice, that keeps me honest, teaches me how to endure the hard times and how to drop below discursive thinking, to taste the real meat of our minds and the life around us." What a great book – for writers everywhere. But only if you're serious about your career. Inspiring!